Kanye West is following his wife Kim Kardashian’s footsteps — straight to the White House to discuss prison reform and inner city jobs with President Donald Trump. Kardashian, 37, was the first member of the infamous Kardashian clan to visit the White House to meet with the embattled American president earlier this year. Now Kanye West, 41, is reportedly preparing to meet with President Trump at the White House on Thursday, Oct. 11, according to The New York Times, via WENN.com . The “Life of Pablo” rapper will attend a luncheon with Trump’s son-in-law Jared Kushner at the presidential residence in the White House, before meeting with the mogul-turned-POTUS in the Oval Office. “Mr. Kushner, who serves as a senior adviser to Mr. Trump, has been focused on overhauling the criminal justice system, and one person briefed on the meeting said that Mr. West wanted to discuss the availability of job opportunities for former convicts,” the New York Times wrote. 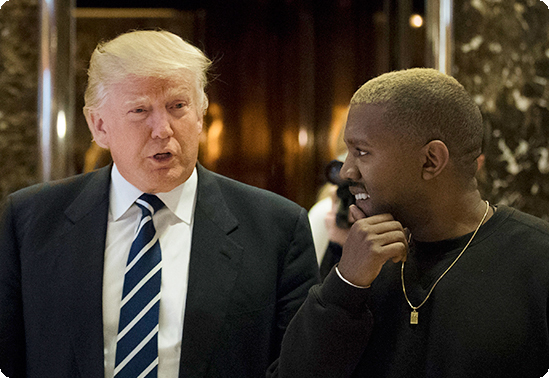 It’s not the first time Kanye has met with Trump during his presidency. The rap musician previously showed his support for the tycoon at Trump Tower in New York shortly after Trump was elected president in 2016. Saturday Night Live last weekend. Kanye also made several controversial remarks about slavery, and shared a picture of himself wearing a baseball cap emblazoned with Trump’s controversial “Make America Great Again” slogan on Twitter. His tweets were not well received by the public or celebrities, and Kanye deleted his Twitter and Instagram accounts on Saturday. Kanye currently lives in Chicago where he is raising his 2-year-old son, Saint West and working on new music with his close friend Chance the Rapper.